Some time ago, I did a post on The compliments wall. Recently, a participant in a training I gave, Ronald Koopman, told me about another exercise with compliments he had done in his team. It goes like this: all the team members sit in a circle. Everyone gets a piece of paper and is asked to write their name at the top of the paper. Once they have done this, they pass the piece of paper to their neighbor on the right. On the paper they have received they write down what they appreciate in this person. Then, they fold the paper so that the name remains readable but the compliment they have just written is no longer readable. Next, the paper is passed on to the next person and the process repeats itself until all papers have come back to their owner. 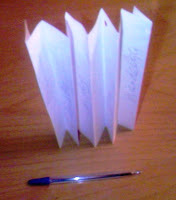 Each paper is now folded like a accordion. At the end of the exercise every team member has a nice list of things his colleagues appreciate in him or her.